So I was thrilled to discover she was publishing another writing guide. But don’t just take my word for it…..there’s an excellent interview with Linda here, at Female First and even more recommendations over at the Womag Blog. This book aims to answer the BIG question. 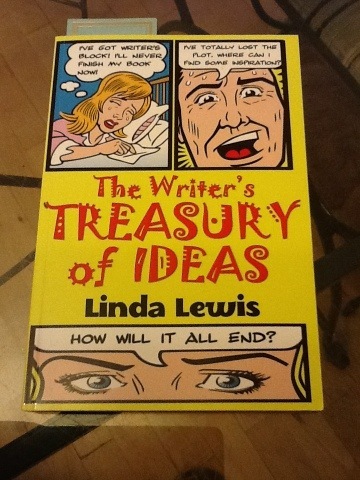 Where do writers get their ideas? Ideas are tricky things. They’re ephemeral. You can’t see them, or take hold of them. They’re also invisible, but like radio waves, they’re everywhere. The truth is that ideas rain down on us, mostly when we aren’t expecting them. The problem that most people face is that they have very big umbrellas. Ideas simply bounce off them, without being noticed. So if you need to capture them, then this book is for you. It’s an insight into the ways and means, some simple, some straightforward, and others, downright devious, that writers use to generate ideas. This entry was tagged Swanwick, Writer, Writer Resources, writers block, Writers Resources, Writing. Bookmark the permalink. Great review, Vikki! This looks like a good book to have around. My problem is not so much getting ideas but – when I go to flesh them out – realize they are actually awful ideas. 🙂 But I guess they can’t all be gems! Lol! It is, trust me! It will now be a permanent feature on my dining room table! I always return to ‘On Writing’ (Stephen King.) This little gem seems to have compressed so much into one smallish (especially for Stephen King!) volume. very nice. yeah writer’s blog and ideation stagnation are tough to deal with. i’ve slowly been pulling out of this latest block and i cranked out 10 pages in one day. that felt good, to say the least. Great tip, thanks. My go-to writing guides are “On Writing” by Stephen King and “Bird by Bird” by Anne Lamotte. There are a few more I rely on, but these two speak to me the loudest. I think because they highlight their writing advice with their personal experiences. You feel less like you’re being ‘taught’ something, and more like you’ve been invited over for a cold beer and a lounge on a sunny deck.